Larry Kim of Wordstream recently published the results of using exit popups on his site. By implementing exit website popups, his company generated tons of new leads with targeted offers they wouldn’t have otherwise seen. It also reduced bounce rates by 60% and increased time-on-site by more than 50%. So what in the world is an exit popup? It sounds complicated, but the premise is pretty simple. An exit popup is triggered when readers are about to leave your blog. It’s like when you’re at a house party. You’ve mingled with the other guests and had a couple of drinks when you decide its probably time to head home. You tell your friend you’re going to leave and she mentions that your crush is on his way over. Your heart skips a beat. Now you have to stay. That one statement stops you and makes you rethink your departure plan. Exit popups use mouse tracking technology to monitor the direction and velocity of your cursor. When it senses that your mouse is going to leave the internet browser window, a popup appears with an enticing new offer, stopping visitors in their tracks. Why should I use them on my blog? Think of exit popups as another way of remarketing to your site visitors - but instead of waiting until they’ve already left, you’re taking a more proactive approach to holding onto them. What if a visitor hasn’t found what they were looking for on your blog? Or what if they’ve gained tons of valuable information from a post but don’t know about your other content? Readers want content quick. They don’t have time to look around your blog for an hour for related posts. A blog exit popup effectively directs readers to your ask by offering them an ebook, a newsletter signup or a free download. In comparison to a scroll or timed popup, an exit popup is much less intrusive to blog readers. The difference between an exit popup and scroll or timed, is that they aren’t interrupting your reader part way through an article. An exit popup appears when a visitor is leaving the blog. If they’re not interested in converting, they can continue on their way. This makes them much less annoying than your typical popup. Think of them less like an interrupter, and more like one last ditch offer before your reader steps back into internet abyss. 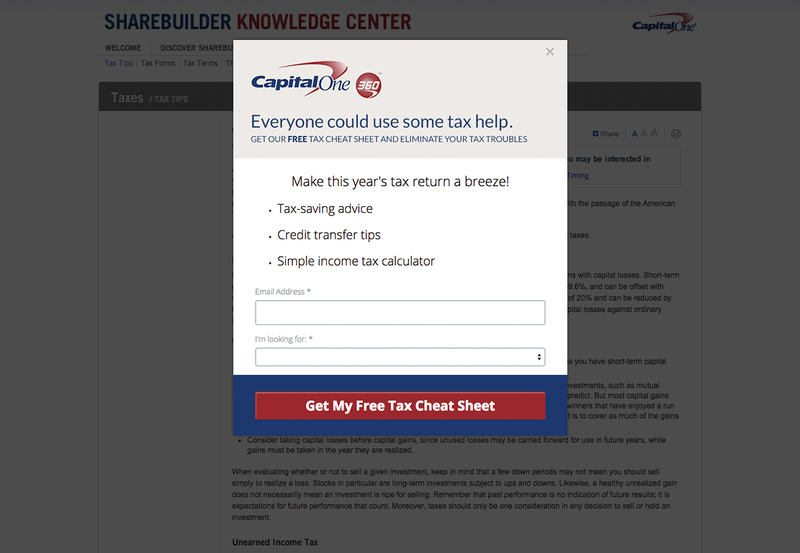 We have created both of these popups for Capital One 360’s blog (formerly ING Direct USA) using the Wishpond popup tool. Capital One’s “Knowledge Center” provides readers with articles on financial advice including stocks, mutual funds, taxes and retirement. Both of these offers work perfectly with the content of the blog article they’re on. When a reader finishes either of these articles and decides to exit, they will be offered more value on a topic they’re currently interested in. 1 - Headline - Your popup headline is what’s going to stop blog readers in their tracks. It should hook them into reading the rest of your popup copy. Your headline needs to be intriguing and hint at a need. Convince readers they have a gap in their knowledge that your offer can fill. 2 - What you’ll learn - You can’t expect readers to download something they have no information about. Give a few short lines about what’s included in your offer, or how it will solve their needs. Think of it as a short list of the benefits they’ll gain from downloading your ebook, guide, etc. 3 - Logo - We chose to include the Capital One 360 logo in both of our exit popups. This shows that it is your own content that you’re giving them, making it more credible. Seeing that the ebook is written by the financial institution itself would give readers more confidence that the information is accurate and believable. 4 - Form fields - The form fields of your exit popup are crucial to conversion. You need to find a balance between maximizing conversions and acquiring all of the information you need. In addition to just an email address field we choose to include additional fields in relation to the offer. In this retirement ebook example, we have asked for how much money the reader has in their retirement savings, how much they plan to contribute this year and their age. A dropdown menu with range options, lets them easily give us that information without feeling it’s too personal. We ask for more information like this to segment our leads in the future. 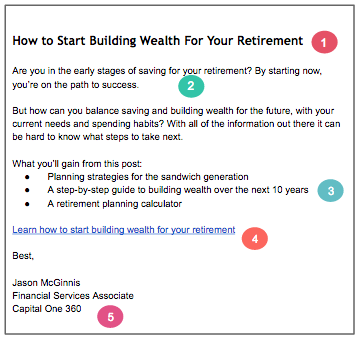 Getting their email is great, but with these added fields we can find out what stage of retirement planning they are at and can estimate their retirement savings fund amount. This allows us to understand who they are, and how to target them with emails in the future. 5 - Call-to-action button - Your call-to-action button is the last thing a reader will see before deciding if they want to click through. Don’t be generic with copy like “submit” or “sign up.” Make it specific to the offer and tell potential leads what will happen when they press that button. Word choice does influence your conversion rate…so choose wisely. Any type of business can ask for more information on a popup to segment leads. So what questions should your business be asking? 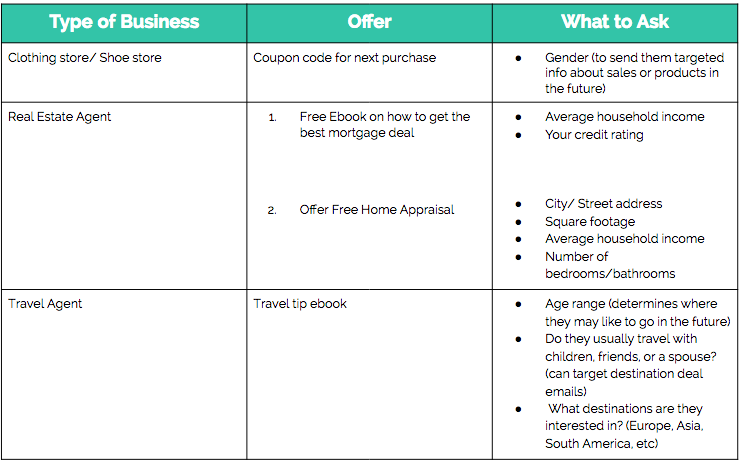 Your popup needs to give your audience relevant, intriguing offers. It needs to be related to the content they’re currently interested in and reading on your blog. This allows you to maximize conversions by grabbing their attention at the right time. Wishpond’s website popup tool gives you a number of options for choosing which URL(s) to add your popups to. Let me show you how to add this exit popup to every URL on your website with the keyword “retirement” in it. 1 - Select “Exit pop-up” from the dropdown list. This will cause other menu options to appear, in relation to the exit intent technology. 3 - You can then choose to limit the impressions (how often) you show the popup to unique viewers. We always select once per week to a unique user. The last thing you want to do is spam your own blog readers to the point where they won’t want to return. 4 - On the right-hand side, enter the URL you would like to add the popup to (if it’s just one specific blog article). If your blog is comprised of multiple articles dealing with related topics, you can choose to enter a “regular expression” as we have done. By entering "retirement" in regex, this retirement ebook popup will be added to any URL that includes the keyword retirement. 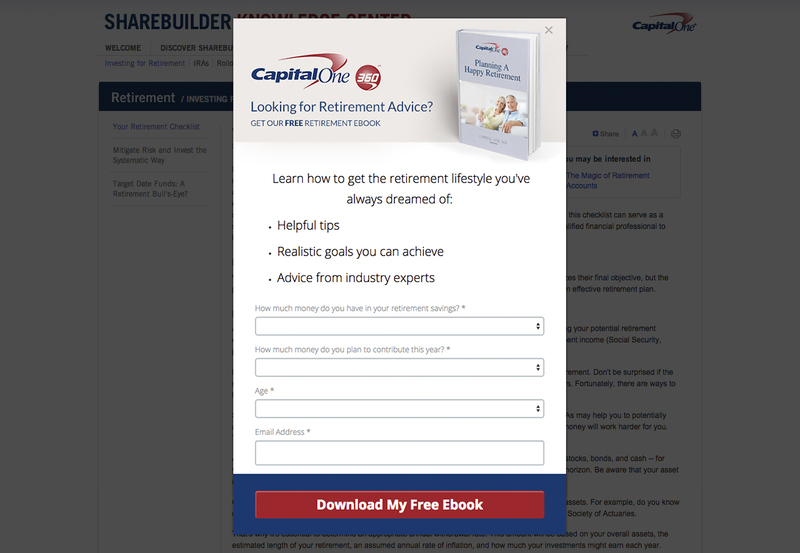 For example, Capital One 360 has another article titled “Target Date Funds: A Retirement Bull’s-Eye.” By including retirement in the URL for this blog post, this exit popup will also be found when leaving that post’s page. 5 - Copy and paste your exit popup’s script code and paste it onto every page of your website. Looking to add popups to your website? Check out Wishpond's Free Shopify Popup Builder App and Free Wordpress Popup Builder App. You’ve captured your lead. Perfect. Unfortunately that isn’t where the hard work ends. Now that you have that reader’s email and their personal information, you need to target them with relevant content to nurture them into a sale. This is where most companies falter. Research estimates that 40-50%of all inbound sales leads are never followed up. You need to communicate with leads in order to turn them into paying customers. You’ll never know the potential of your leads for your business without targeted follow-up. A drip email campaign is a set of email messages sent out to leads over time, personalized based on their preferences, needs, or interests. It allows you to follow up with leads, and gradually nurture them into sales for your business. It allows your business to remain top-of-mind, and can even prompt action. By opting-in to your exit popup your lead has shown interest in a specific topic. With this we can choose to send specific emails, promoting other content that will suit their interests and needs. A great lead nurture “recipe” to follow is to send four content-focused emails, followed by one sales email. Think of the first four emails as how you wine and dine your new love interest, before proposing that they become your boyfriend or girlfriend (the ask email). 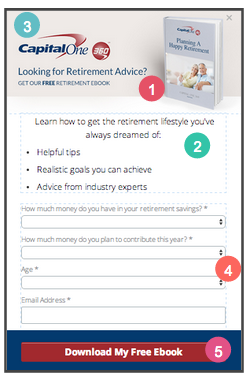 In this example, I’m going to focus on a segmented email campaign for a retirement ebook lead. I have segmented all of my leads based on the amount of money in their retirement savings, how much they plan to contribute this year, and their age. This allows us to segment them based on what stage of retirement planning they are likely in, and to estimate their income or retirement amount. Based on this we can see that this individual is likely in the earlier stages of retirement planning, and looking for advice as they begin building their savings. Our content emails will provide them with blog posts based on this information. 1 - Headline - Use your article title or an intriguing phrase related to the topic to hook in email leads. The headline needs to convince them to read the rest of the email. It should tell leads exactly what your article is going to be about. 2 - Introduction - Include a couple sentences to tell leads why they should read your article. Play off of their needs so they believe not reading your content would be a terrible mistake. 3 - What you’ll gain list - Include a list of benefits that leads will get from reading your piece of content. A short, bulleted list makes it easy for them to scan and see what’s included. Give 3-4 specific items that would entice leads to say “yes”. 4 - Call-to-action link - Link the title of your article at the bottom of your email. You want it to stand out and be easy to locate, but still flow with the rest of the email. 5 - Signature - Include your name and job title. This makes the email much more personalized. People respond better to emails from real individuals that they can communicate with. 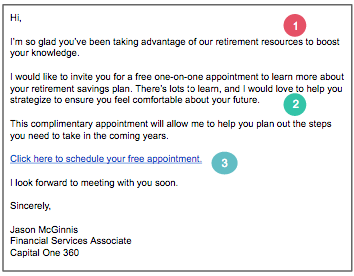 An email like this gives leads specific, reliable content and extends your relationship. 1 - Introduction - Start this email in a more personalized way. Tell leads you’re happy they’ve been reading your content and following along. This seems more welcoming and humanized and shows that you pay attention to your leads. 2 - Invitation/Ask - Include a few sentences inviting them to come in for an appointment or to setup a meeting. Why should they come? What’s the benefit to them? Briefly explain how you can help them succeed. 3 - Call-to-action link - Include your call-to-action at the bottom so that leads can directly signup from your email. Make sure to choose words that flow with the rest of the email, but also reinforce your offer (a free appointment) again. A drip campaign allows you to gradually build a relationship with your new lead. By segmenting leads from your website popup, you’re able to target them with posts that they’re genuinely interested in. Lastly you can grow the relationship with a sales email, turning that new lead into a prospective customer for your business. Your blog readers are valuable. Don’t let them read and run. 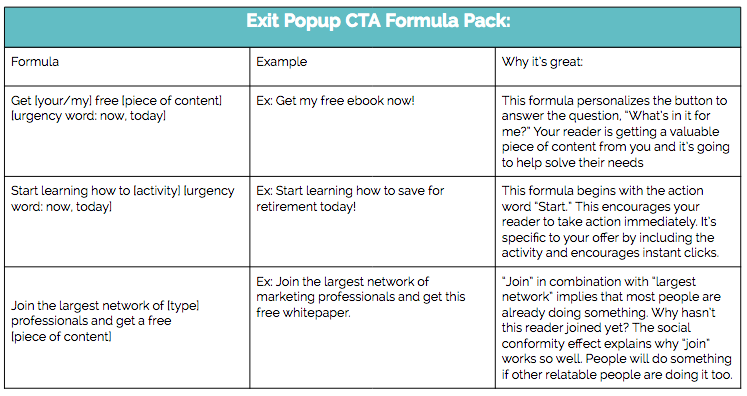 Just by implementing exit intent popups on his website, Neil Patel increased conversions by 46%. Now it’s time for you to transform your blog traffic into engaged leads with exit popups. Use the resources below to get started right away.